Although elevated intraocular pressure (IOP) is a main risk factor, more and more attention has been paid to other factors contributing to the development and progression of primary open-angle glaucoma (POAG) [1–16]. Among those factors, narrow retinal vessels and IOP-related stress have been found associated with glaucomatous optic neuropathy in many clinical trials and population-based study, which furnishes the basis for the vascular mechanism of POAG [1–7]. 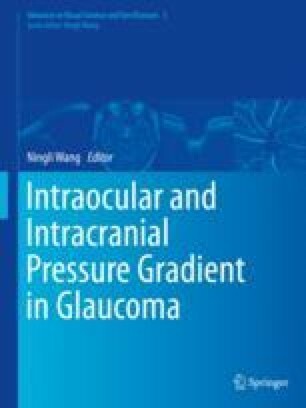 Lower lumbar cerebrospinal fluid pressure (CSFP) and narrower orbital cerebrospinal fluid space are found in some normal-tension glaucoma patients, compared with normal subjects and POAG with high IOP . Higher CSFP was found relevant to higher body mass index (BMI), and BMI has been reported to be positively correlated with neuroretinal rim area and retinal nerve fiber layer thickness [10–13, 17]. A proven formula was employed to estimate the CSFP in the Central India Eye and Medical Study, instead of the direct measurement which lacks feasibility in such a population-based study. The same formula was also used in the Beijing Eye Study [8, 18, 19]. Along with the CSFP, the trans-lamina cribrosa pressure difference (TLCPD: IOP minus estimated CSFP) was also estimated. A lower estimated CSFP and a higher TLCPD were found associated with the presence of POAG and the severity of optic nerve damage [8, 9, 18].